More than a million people have crossed the finish line of the New York City Marathon—1,176,549, to be exact. On November 4, 2018, you could add to that number when you cross the iconic finish line in Central Park. The finish line has been in the same place—on West Drive in Central Park, adjacent to Tavern on the Green restaurant—throughout the race’s nearly 50-year history. For the first six years (1970–1975) the course was four-plus loops of Central Park. The runners approached the finish from the north. Crowd control and security were a bit lacking in those early days. Fueled by the running boom sweeping the country, the New York City Marathon grew from 55 finishers in 1970 to 339 in 1975. Central Park could no longer contain them. Manhattan Borough President Percy Sutton crowned the 1975 women’s champion, and the photo made front-page headlines. Seeing the marathon's newsmaking potential, Sutton helped jumpstart an effort in 1976 to make it a five-borough event. The 1976 New York City Marathon course ran 26.2 miles from Staten Island through Brooklyn, Queens, the Bronx, and Manhattan. 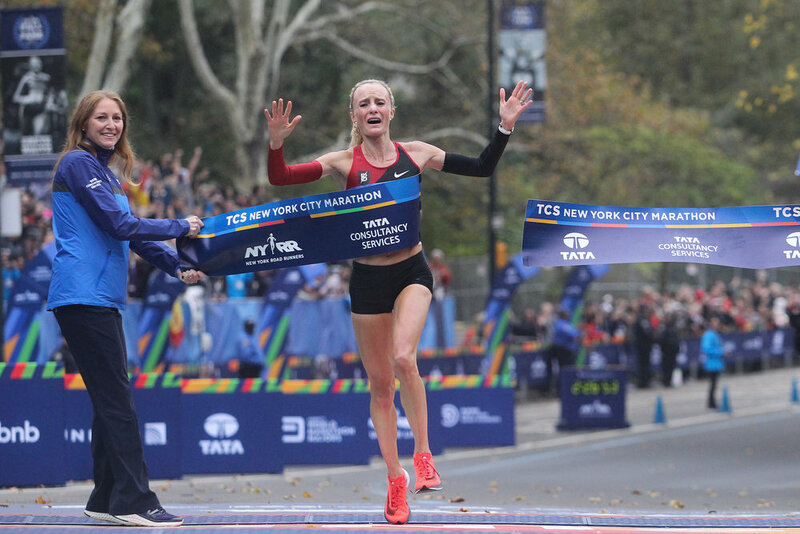 Men’s champion Bill Rodgers, women’s winner Miki Gorman, and more than 1,500 others crossed the finish line in Central Park, and the five-borough race was firmly planted on NYC’s annual calendar. After Rodgers won four straight New York City Marathons from 1976 to 1979, Alberto Salazar took the reins, winning three consecutive titles from 1980 to 1982, including this 2:08:13 performance from 1981. The New York City Marathon grew and grew—over 20,000 people crossed the finish line in 1987, 30,000+ in 1997, 40,000+ in 2009, and 50,000+ in 2013. Finishers included Fred Lebow, the president of NYRR and race director of the New York City Marathon from 1972 until his death in 1994. Lebow ran the 1992 New York City Marathon while in remission from cancer, finishing with nine-time champion Grete Waitz. The 2017 TCS New York City Marathon had 50,773 finishers, from handcycle winner Ludovic Narce of France in 1:28:48 to final official finisher Sheryl Morley in 10:44:26. Shalane Flanagan made history by becoming the first American women’s open champion in 40 years. On November 4, 2018, an expected 50,000+ runners will join the ranks of New York City Marathon finishers. You could be one of them. This race will move you in so many ways. Apply by February 15, and get ready to be a part of history this November. Jan 24 NYRR President and CEO Michael Capiraso Is Motivated to #ResolveToRun in 2018—How About You?